ONE PHONE NUMBER. ONE PLACE TO FIND HELP. 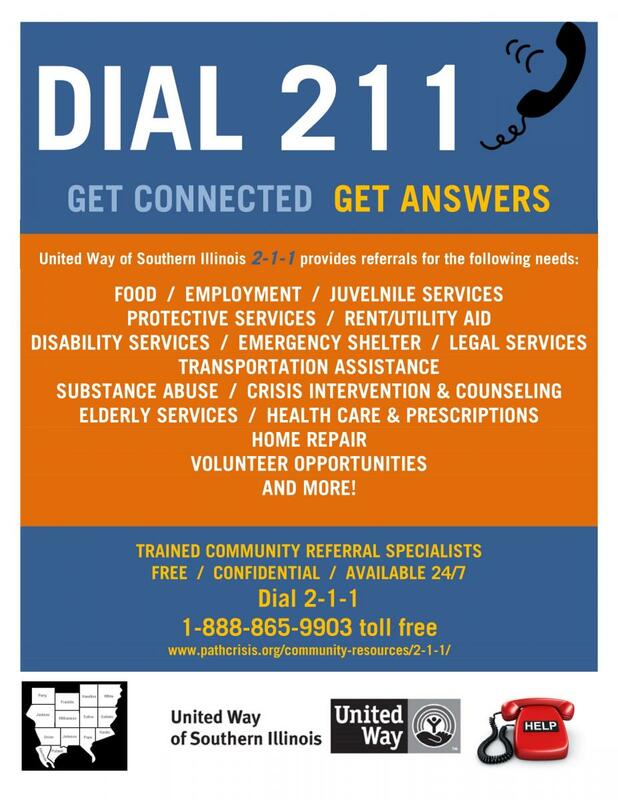 2-1-1 is the number to call if you need to find health and human services in your community. It is a free service that is available 24 hours a day, 7 days a week. During disaster or other emergency, the United Way 2-1-1 becomes the Disaster Assistance Hotline, available 24 hours a day, seven days a week by dialing 2-1-1 or (888) 865-9903. 2-1-1 is an established information and referral call center. In a disaster situation, simply dialing 2-1-1 is the quickest way to access non-emergency resources for your family, your neighbors and your employees. During disaster or other emergency, remember: If you need Police, Fire, or Ambulance, dial 9-1-1. For all other help, dial 2-1-1. This helps divert inappropriate calls away from the emergency network. What does 2-1-1 do during a disaster? Maintains up-to-date information through collaboration with emergency management and disaster response agencies whether local, state or federal. What resources might 2-1-1 connect me with during a disaster? 2-1-1 is recognized by local municipalities, agencies and FEMA as the primary source of information regarding human services resources for victims of crisis. As a member of the disaster response network 2-1-1’s primary mission during times of disaster is to maximize community access to critical resources. It is essential to understand that 2-1-1 does not replace or threaten any of the existing disaster preparedness infrastructures. What is does do is offer another layer of possibilities to the existing response system. 2-1-1 is a combination of information management, easy access for the public, live call specialists and connection to a comprehensive web of services and service providers. The following is an initial look at possible functions of 2-1-1 in Southern Illinois during and following a disaster. Manage and track available resources – 2-1-1 maintains a constant list of resources dedicated to disaster. However, during an event of this kind, resources are obtained and created in direct response to the local conditions, and these change regularly. As an official Public Information Source, 2-1-1 works closely with local Emergency Services, non-governmental agencies, and others to maintain up to the minute information on who is doing what where. Manage and track requests for resources – 2-1-1 is marketed during disaster as the public information outlet. Having a single point to send people looking for information means that trends and emerging needs can be monitored using the 211 disaster database and reported back to decision making bodies. Provide comfort and assurance – people will need a place to call. Call specialists are prepared to listen to a variety of needs, many times just the need for people to connect with someone. The 2-1-1 system offers an easy-to-remember telephone number that invites people to call. Volunteer management - The incidence of spontaneous volunteerism is enormous following a disaster. And the single most wasted resource following disaster is the army of those wanting to help who are turned away because of a lack of organization. We are working to build volunteer management teams that will be prepared in multiple areas of the region to manage unaffiliated and affiliated volunteers. 2-1-1 becomes an easy link for people wanting to volunteer to know where to go to help. Donation management (both financial and in-kind) – Once again, the single phone call to 2-1-1 will connect you with the authentic donation management conduits that are created during disaster, allowing you to sleep easy knowing your dollars are going where you meant them to go. Information for coordination of services – the 2-1-1 center will know who is providing what kind of services, when and for whom. This information becomes a critical piece to locating victims, providing comprehensive relief and recovery services. This information will be provided at meetings, on the Internet and in pamphlets as needed. Rumor control – Callers often are the first to hear rumors that can spread quickly across the internet, or even from the media. Because 2-1-1 communicates directly with Emergency Operations during disaster, dangerous rumors can be caught and forestalled quickly. Evacuation/traffic issues – the information and referral center will get calls about evacuation routes or highway closings. We will work to maintain the latest information to respond competently to public requests for such information. Travelers’ aid – persons may become stranded in the community as a result of the disaster. If possible, use the normal system to respond to the traveler’s needs. If overwhelmed, contact nontraditional agencies and seek assistance on behalf of the travelers. Displaced pet location – although there are not many such agencies providing this kind of service in southern Illinois, many agencies step up during a disaster and offer to fill this role. 2-1-1 is the easy way to announce this service and to connect those who need it to it. Information for corporations – as a United Way program, 2-1-1 may already have a relationship with many corporations that can and might, if asked, play a role during disaster.